This top rated RV Park first impresses you with attractive landscaping features, maturing shade trees, and clean, wide, paved roads with concrete curbs. We pride ourselves on the quality and cleanliness of our grounds. 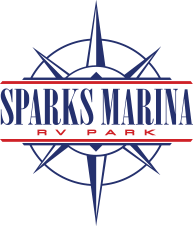 Our park is in a quiet off-highway location and within walking distance to Sparks Marina Park with fishing, boating, a large children’s playground, and an exceptional off-leash dog park. Click here to see more local activities. RV Sites are level, spacious, and equipped with full hookups, picnic table, & concrete pad.